Where Do People Check Their Mobile Phones? 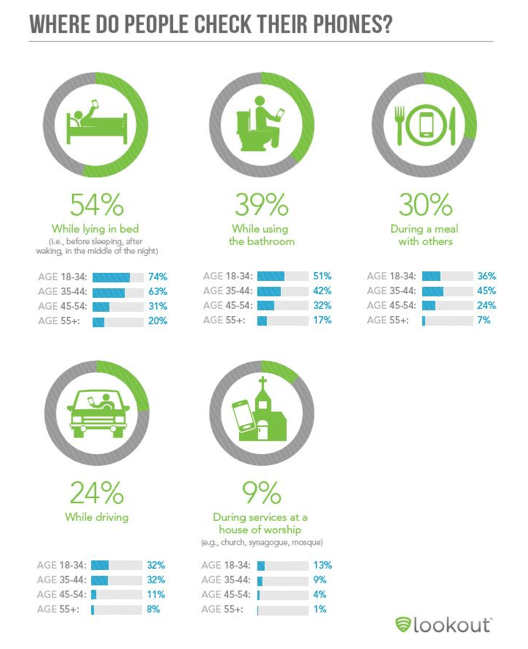 Usage varies across different age groupings. The 18-34 age group are the most dominant in almost every category, except for the the 35-44 age group that edged them out when it came to using a phone during a meal with others. Mobile drives our days. Users dive into their mobile devices frequently throughout the day. More than the information where people check their mobile devices, I guess this helps us see in which age bracket is the most active when it comes to using mobile devices. This helps me understand which age bracket is a more potential customer in the future.